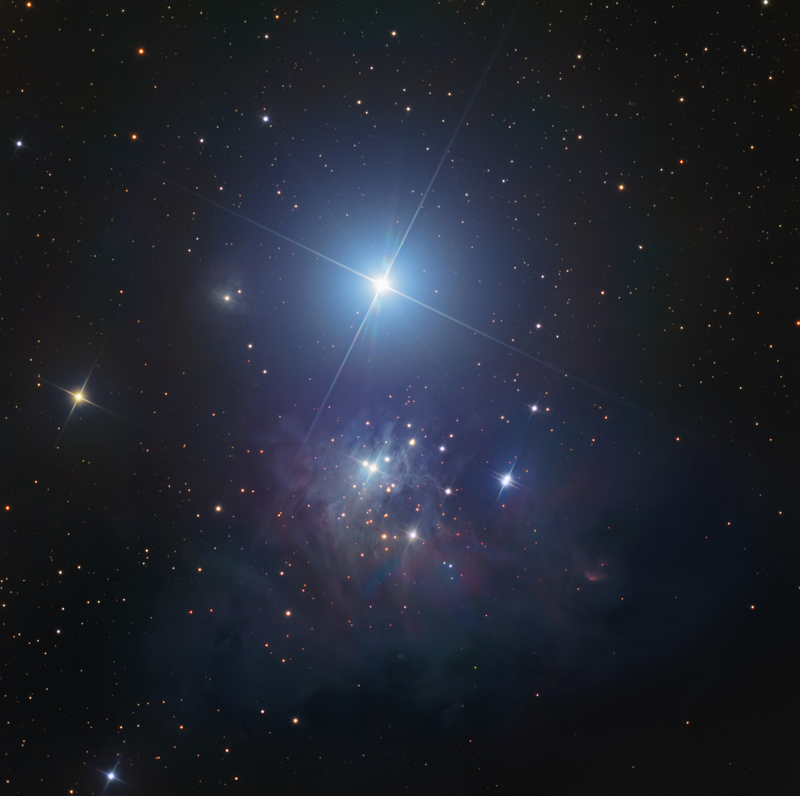 IC348 is a star forming region just south of the bright mag 3.8 star o-Per at the bottom end of the constellation of Perseus. Actually, IC348 refers to a young, open cluster that is ~990 light years distant and that is responsible for the reflection nebula, VdB 19, shown in the above image. The cluster has at least 15 stars larger than our sun, over 300 stars of all sizes, and 26 brown dwarf stars. It is difficult to study for researchers due to a highly variable extinction across its face, because it appears behind two sheets of obscuration, one associated with the Taurus dark clouds at about half its distance to us, and the other with the Perseus dark clouds. Lynds dark nebula 1470 (Barnard B4) begins at the lower right portion of the image where fewer stars are seen and extends further south and east. IC348 is part of the Perseus OB2 association. Star formation occurred from 0.5 to 3 Myr ago. Most of the stars have lost their disks suggesting that IC348 is likely near the end of its star forming phase.